The Professor had been with ESPN since 1995. When ESPN was in the midst of massive layoffs last month, we knew that all the names would not be publicly released at the time. While many individuals commented about their status on Twitter and others were revealed through local interviews or other sources, there were some who chose not to reveal those events publicly. There were also some who were in the midst of negotiating with the network, trying to come to a new deal that could see them stay with ESPN. The Professor’s tenure at ESPN is coming to an end. NFL insider John “The Professor” Clayton is leaving ESPN as part of the sweeping layoffs at the Worldwide Leader in Sports, sources tell Sports News. ESPN and Clayton both declined comment. The well-respected Clayton has served as a senior NFL writer and commentator at ESPN for 23 years. Clayton hasn’t tweeted since the end of April until this morning, but perhaps his situation wasn’t as noticeable because A) it’s the NFL offseason and B) Clayton has frequent gaps in his tweeting. He already has another gig to keep him busy, at least in the short term, as he began hosting a two hour radio show on ESPN Seattle last summer. Below Clayton shared some thoughts and an inside joke about speculation that he has a pony tail. I guess you saw the news. After 23 years I won't be contributing to ESPN. Two words. Thank you. My bosses and co-workers are the best. I am well taken care of by ESPN. I have daily show on 710 ESPN Seattle 10 to 12 pacific. I fill in on Sirius on moving the chains. I can honestly say that my relationship with ESPN was the second best in my life. My marriage to my wife Pat is obviously No. 1. Clayton has been one of the most recognizable faces covering the NFL for many years in Bristol, but as the Sporting News points out his most memorable moment at ESPN might be his This is SportsCenter commercial that featured a new side of him. The news about Clayton would seem to fit with the type of person most affected by ESPN layoffs – longtime news reporters and insiders that cover a specific sport. Think about it – Clayton, Ed Werder, Jayson Stark, Marc Stein, Brett McMurphy, Chad Ford, and Andy Katz were all among the layoffs this year. All of them have the skill set to deliver breaking news and insights about their particular sport, but ESPN chose to let them all go. 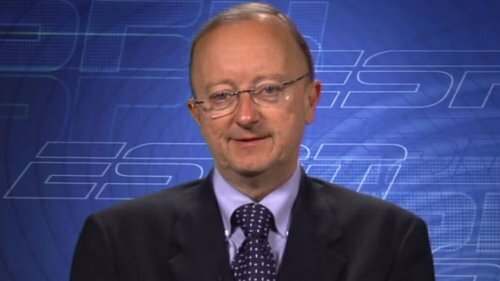 Ed Werder and now John Clayton-what can ESPN be thinking letting go 2 of the best at what they do and 2 great guys. Amidst the layoffs, ESPN has constantly defended their dedication to journalism and their news reporting capabilities. However, when it comes to breaking and covering news, there’s no doubt ESPN is going to be affected in some way when people like Clayton and others are no longer working at the network.